It’s being pitched as a cross between A Discovery of Witches and Jonathan Strange and Mr. Norrell. I haven’t read the former but I’m very familiar with the latter and I think the primary point of comparison is the historical nature of both. But Jonathan Strange has a sweeping scope and relies heavily on adding to known history. 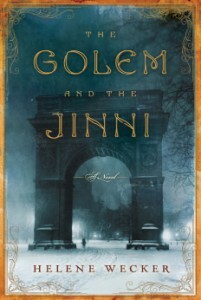 The Golem and the Jinni is far more personal in scope, describing a story that might have happened under our noses. It’s an intimate, beautiful look at the lives of only a few people both fantastic and mundane. And because I judge books quite a bit by their endings, I’ll add that it has an enormously satisfying conclusion, too– although I admit I’d happily read more books about the Golem and the Jinni. I could go on– but I’d rather just give a copy away. I will give away one hardcover, shipped via Amazon, OR one ebook from the ebook vendor of your choice OR the audiobook (via Audible). Retweeting (or otherwise sharing) the giveaway with your friends will gain you additional entries. As far as I know, the book is currently only available in the United States, so the contest is only open to people with addresses in the US. The contest runs from now until 12:01 AM Saturday PST, and I’ll contact you when the contest is over. ETA: The contest is now over and a winner has been chosen and notified! Everybody else, thanks for participating and I hope you’ll still check out the book! The story that most immediately comes to mind that has one of those is The Adventures in Kavalier and Clay though I doubt that is the type of story about a golem that you were seeking. The golem isn’t itself a character. C.E. Murphy’s series (Heart of Stone, etc) does have djinni and where her gargolyes aren’t exactly golems, they are akin. I recommend it! You know, I’d say that Naomi Kritzer’s Dead Rivers Trilogy is my favorite story about djinn. One of my favorite golem stories is from one of The Simpsons Halloween episodes. Supernatural just did an episode with a golem. Okay, not a book, but it still counts, right?